Sometimes when you look behind something that’s been in front of you for years you find out things you would have never imagined otherwise. Such is the case with the song, Nature Boy. Nature Boy, as recorded by the great Nat King Cole, has long been one of my favorite songs. It has a wonderful haunting melody and tells the story of a “strange enchanted boy” and his search to find love. It always has had a sort of mystical feel to me, a real oddity in the world of popular music in 1948 when Nat King Cole recorded and had a huge hit with it, staying at #1 on the charts for eight weeks. I was going to just have a short post and put up a YouTube video of Cole’s version but in doing so I saw the name of the songwriter, eden ahbez, and was intrigued. 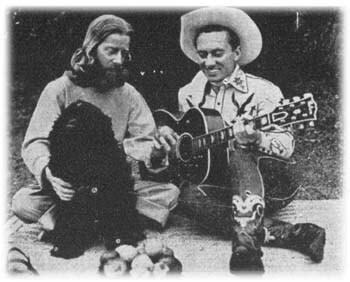 Doing a little research I came across some photos of him such as the one above, from the late 40’s sitting with Cowboy Jack Patton ( who wrote Ghost Riders in the Sky) and a spaniel. I’ll let you figure out who is who in the photo. ahbez’s long hair and attire seemed really out of place for me in thinking of 1948 so I read on. 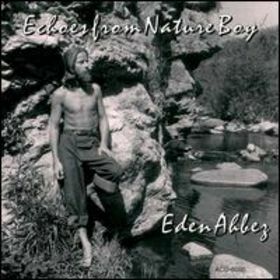 eden ahbez was a real one of a kind character in the world of music and in general. You could probably guess that from the name which he adopted and wrote only in lower case letters. Born in 1908, he is regarded as the first hippie by many, a long-haired and bearded wanderer who crisscrossed the country on foot, wearing robes and sandals, maintained a vegetarian lifestyle and slept out under the stars. In fact, when Nature Boy hit the charts he and his wife were living under the first L on the Hollywood sign, which stoked a bit of a media frenzy around ahbez. He worked in and frequented a vegetarian restaurant (that’s where he met Cowboy Jack Patton, another interesting character) in 1940’s Los Angeles whose German owners preached the gospel of natural and raw foods. Their followers became known as the Nature Boys.